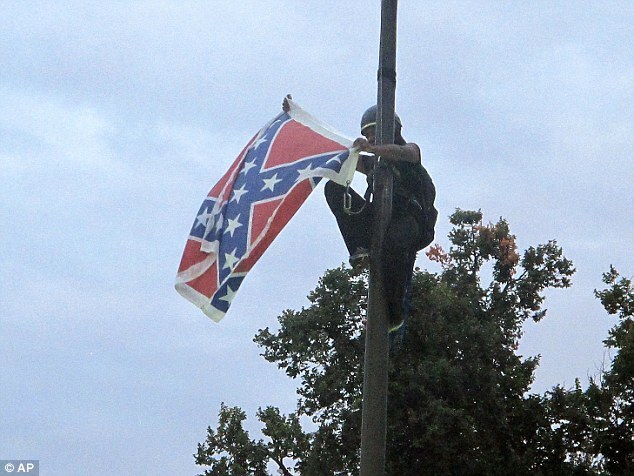 As much as I loved to see Bree Newsome climb that flagpole and put in serious work this morning, I have to confess that taking down the Confederate Flag won’t make me feel any better. Drafting stricter gun control laws won’t put my soul at ease either. What would make me feel better about the nine people murdered while they prayed in a South Carolina church is if the person who killed them was actually treated like a mass murderer as opposed to a child who threw a temper tantrum or unconsciously hurt someone’s feelings. I was sickened when I saw the arrest of Dylann Roof. Perhaps even more sickened than when I read about his initial crime. In the video he pulls over to the side of the road and is very calmly and gently handcuffed and walked to an awaiting squad car. It is confirmed that the officers later took him to Burger King because he said that he was hungry. There was no repulsion from the officers, no rage, no yelling, no violent search, none of the officers roughly crammed his body to into the patrol car after he was handcuffed. No. It was almost as if they all felt sorry for the kid. The 21 year-old-kid who accidentally walked into a church, befriended a prayer group and then blew all of its members away. They treated this heathen as if he had done god’s work. I’ve seen a child as young as 12-years-old have his head slammed against the trunk of squad cars for participating in a dice game. I’ve seen suspects pulled out of car windows, and I’ve seen faces smashed into the concrete by arresting officers. Just at the beginning of this month Dajerria Becton was slammed to the ground and had a cop put all of his bodyweight on her because she was suspected of attempting to illegally enter a swimming pool, but Dylann Roof on the other hand—Dylann Roof is a special kind of suspect. He could be any police officer’s child or brother or, to be quite honest, he could be any police officer. They probably envied him for being able to kill all of those black people at same time while they can only pick them off one by one. One can see that the officers care about Dylann Roof in the same way that the judge at his arraignment showed that he cares for him by announcing that Dylann’s family are victims. The Judge said this at a time when Dylann could have literally still had the blood of those which he had slain on his flesh. He could have still had gunpowder residue on his fingertips and his adrenaline was probably still charged from his bold strike for the white race yet, in that moment, he is viewed sympathetically and that judge and those officers and maybe even the whole system have the compassion to immediately see the humanity in this killer. Even though he has yet to apologize or express remorse. He hasn’t found Jesus or cried or looked afraid or ashamed yet the system has a place in its heart for the Dylann Roof’s of the world. I mean I’m sure that one could ask any drug dealer in Charlotte or Raleigh (who hasn’t killed anyone) is it North Carolina state policy to buy suspects fast food after an arrest and they would laugh out loud. If one had any doubts about the existence of white privilege in every single facet of the American Judicial System then the handling of Dylann Roof should burn that doubt to a crisp similarly to how Dylann was photographed burning the American flag. So no I really don’t care if every state building in the South takes down the Confederate Flag or if every major retail store in America refuses to sell it. For the original Confederacy was a group of treasonous guerillas that rejected federal law by violent means therefore I’m sure the descendants of these individuals will not hesitate to continue to wave its flag and believe in its principles whether it’s on front of the state capital building or not. All I wanted was for law enforcement to look past the color of a suspect just once to see that Dylann is a vile human-being who need not be treated delicately and need not be given a value meal on his way to jail. But that didn’t happen. America has waved its true flag in dealing with the South Carolina massacre and that flag isn’t orange and blue nor is it red white and blue. That flag isn’t decorated with stars and bars nor is it decorated with stars and stripes. That flag is all white. For white is the only color that has ever mattered in this country. This entry was posted in Uncategorized and tagged African-American, Bree Newsome, Dylann Roof, Emanuel African Methodist Church, South Carolina, The Confederate Flag. Bookmark the permalink. Everything that you say is true, Roger. But, Dylann Roof will get what he deserves in the not too distant future. He’ll be convicted on nine counts of murder in South Carolina and he’ll either get the death penalty or life without parole if his attorneys cut a deal for him. However, it appears he is also going to be charged at the federal level where he will most definitely be convicted for a hate crime and/or terrorism, and he will get the death penalty or he’ll rot in a super max prison for 60 or 70 years. Taking down the Rebel battle flag from public property is a good idea, in my opinion. All of these white southerners who are whining about their history and their traditions and so forth are referring to the revisionist version of Civil War history known as the Lost Cause. This is what they teach and pass down like folklore and it’s nothing but lies. Americans need to own every bit of their ugly history from the genocide of Native Americans up to the present. Maybe getting rid of these Rebel flags and then getting rid of the monuments to the confederate leaders, and taking their names off public buildings and streets is exactly what needs to happen. Can you think of any other country that has had a civil war or revolution or military coup and allowed the losers to fly their flags and have monuments honoring their leaders, the losers, for 150+ years and counting? One of the major problems we have in this country is that people, mostly white people, are taught things about this country that are just simply not true. When confronted with the truth, many of them reject or deny it, because they don’t want to give up their “history and traditions.” Taking away their symbols, at least those that are in the public domain, is really a first step in replacing their lies with truth. And maybe we can build on that someday. I respect where you are coming from Liza.